Our finest and most beautiful chess pieces have been brought together in one unique collection, The Regency Collection. The collection will only include chessmen of unrivalled quality and design, for those insisting on the best it is the only collection of chessmen to consider. All the sets in the collection are limited editions, extremely rare and highly collectable. Only the finest woods are used and rigorous quality control ensures that only perfectly formed pieces end up in the sets. Every set in the collection comes supplied with a certificate of authenticity which confirms it to be a genuine Regency Chess Company product. The certificates carry a unique serial number as well as an edition number. The edition number represents the number of sets that have been made so far. Every certificate has been signed by our company director, is embossed with our company stamp and has been filled in with our unique blend of company ink. Each set that is sold is recorded on our database with a unique numbering system, this means fake sets and copies will be easily unmasked. Our chess sets will be around for a lot longer than we will, so it's important for future generations to know the details and origins of the sets they inherit. If you would like to find out more about our Luxury Chess Pieces please contact us. 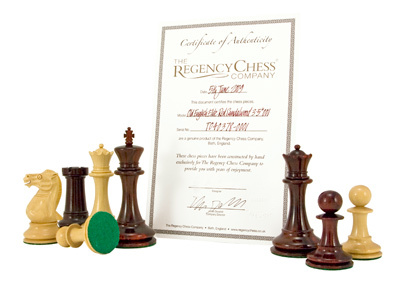 *Certificate of authenticity accompanies all luxury chess pieces from the Regency Collection range.